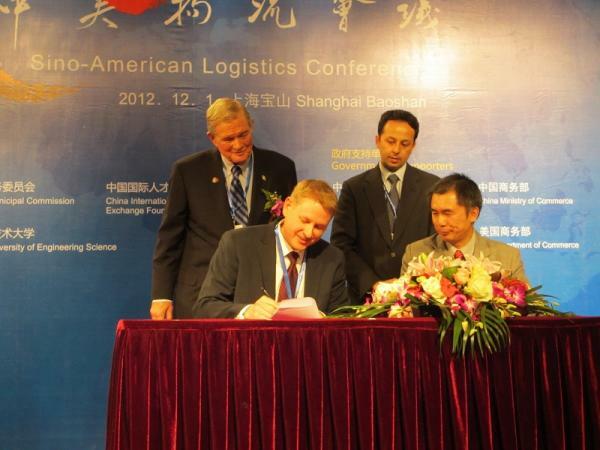 Members of the Midwest-China Hub Commission and the American Society of Transportation and Logistics signed an agreement in Shanghai on Saturday to pursue expanding trade between the U.S. and China, and in particular adding new airfreight routes between the Asian nation and St. Louis. Tim Nowak is Executive Director of the World Trade Center St. Louis. Nowak says Missouri will have exported over $1 billion in products to China by year’s end, but suggests that figure could be doubled or tripled if Lambert Airport is established as a major air cargo hub. Last year, China Cargo Airlines began cancelling flights to St. Louis after Missouri lawmakers failed to pass legislation, dubbed "Aerotropolis," that would have provided $360 million in tax breaks designed to turn Lambert Airport into a major air cargo hub. The trade mission is being jointly led by the World Trade Center St. Louis, St. Louis County Executive Charlie Dooley (D), and retired U.S. Senator Kit Bond (R). The delegation is scheduled to return to Missouri on Friday.